Stabilization by means of conventional additives cannot be carried out on soils with sulfates because the calcium in these additives adversely reacts with the sulfate present in the soil. This signifies important technical, economic and environmental implications that have remained unresolved until now. A piece of research, in which the UPV/EHU lecturer Beñat García-Grancianteparaluceta is participating, indicates that the use of an alternative, magnesium-based additive would avoid the problems of the calcium-based ones allowing the constructional properties of soils with sulfates to be improved more cost-effectively and with lower environmental impacts. The journal Applied Clay Science has recently published the paper ‘Sulfate soils stabilization with magnesium-based binders’, a piece of research led by Dr Andrés Seco-Meneses on the stabilizing of sulfate soils in which Beñat García-Grancianteparaluceta, lecturer in the UPV/EHU’s Department of Mining and Metallurgical Engineering and Materials Science, has collaborated alongside a group of researchers from the Department of Projects and Rural Engineering of the NUP/UPNA-Public University of Navarre and from the company Magnesitas Navarras, S.A.
“Sufate soils are highly abundant materials in nature. Yet their poor constructional properties mean that they are materials that are unsuitable for executing a whole host of works. As a result, they have to be removed and taken to landfills and be substituted for materials extracted from quarries. All this leads to considerable economic and environmental costs which have until now been unavoidable,” explained the lecturer at the University School of Engineering in Vitoria-Gasteiz. The difficulty in stabilizing soils of this type is due to the fact that the regular stabilizing additives are calcium-based. In these cases, the sulfate combines with the calcium in the additive and the aluminium in the clay resulting in a highly hydrated expansive mineral known as ettringite. This causes the treated material to swell and even destroys it. The study now published analyses what happens when calcium-based additives are replaced by a magnesium-based alternative additive, an industrial by-product known as PC-8. “Treating natural soils with 4% and 8% of lime or PC-8 improved their mechanical properties to levels routinely obtained in other clayey soils. In all the cases, the resistances developed were greater for the doses of 8% than for those of 4%, and for the PC-8 over the lime, demonstrating the capacity of magnesium rather than lime as an additive with the potential to stabilize clay from the mechanical perspective,” said Beñat García. In the samples treated with 8% PC-8 a significant reduction in the natural swelling of the soils was observed, as was the dimensional stability of all the samples treated over time. As far as this UPV/EHU lecturer is concerned, “the conclusion is that the use of magnesium-based additives could potentially be a good method of upgrading materials containing sulfate in construction applications”. 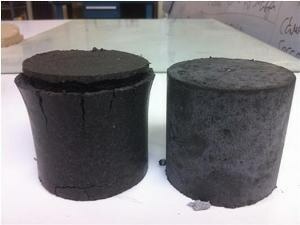 Although further studies in this direction are needed, the results obtained point to an improvement in the constructional properties of the soils treated, which turns them into materials suitable for building purposes. This allows significant savings to be made, and the environmental impacts associated with the generation of landfills and the mining of materials in quarries to be reduced.